The Sunday Salon [3.20.2011] – my books. my life. We are still enjoying beautiful March weather down here in Florida. I am trying to savor it before it gets crazy hot again. Thus, March weekends are full of visits to the beach, reading by the pool, and baseball games. It’s pretty awesome. I’m doing alright with the meals but I am being a little flexible, especially where it comes to protein because I am rather limited in my options and I normally wouldn’t try to eat protein at every meal. The water was tough at first but I’m getting used to it. Sleep isn’t a real issue for me nor is exercise, although I normally exercise 4 days a week so I had to throw in some extra workouts. My bad habit is leaving clothes/shoes strewn about the apartment so I am putting them in their proper place immediately. My good habit is to read for 30 minutes every single day (I normally don’t read much during the week). I will probably let you all know how it’s going because it is consuming a lot of my life right now. Given the slow speed at which I read, you’d think I’d be able to keep up on reviews. You would be mistaken. I am woefully behind. But as always, I hope and plan to catch up. 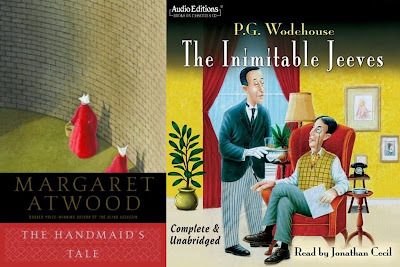 This week I finished The Handmaid’s Tale by Margaret Atwood (after you all told me I really had to) and The Inimitable Jeeves by PG Wodehouse (audio). 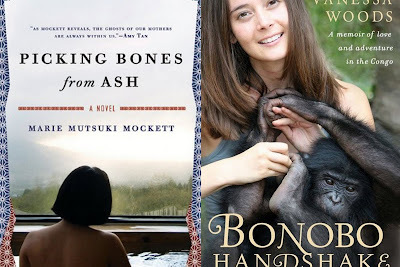 I am currently reading Picking Bones from Ash by Marie Mutsuki Mockett (loving it) and listening to Bonobo Handshake by Vanessa Woods. 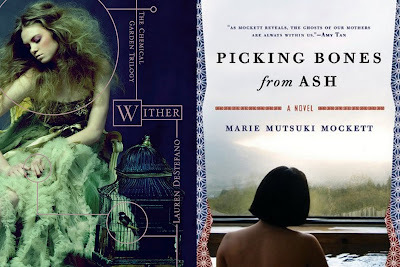 You can expect (I make no promises but I shall try) reviews this week on Wither by Lauren deStephano, Picking Bones from Ash , and an undecided older book for Thursday. That’s it from me this week. Enjoy your Sundays, everyone. I feel a lot better this week than I did last week, no random all-over crappiness. You? I’ve done the game twice – but not in a row, so color me impressed that you guys are going for six weeks. I felt incredible the first time I did it. It was a challenge, but it felt good to be eating right and paying attention to everything that went in my body. Good luck, and I hope you meet whatever goals you have set for yourself. The weather has been rather nice here, although I am dreading when the temperature starts rising in the summer. Also, good luck with the Game on Diet, I know that a lot of bloggers participated in it in the past and were rather pleased with the changes they made. I imagine the water thing would be the hardest thing for me as well. I also hope you enjoy Wither. I have it on my list for an upcoming read, and I am rather excited about it!